To order a Family Date Pillow Cover, please E-Mail me with the various names, dates, etc. When I have received your information, I will fill out my order form, scan it and email it back to you to ensure I've understood your order correctly. Once I have the information correct, I will proceed with your order. The surname that you would like stitched vertically on the left side of the pillow. 16" square pillow cover: $50.00 up to four names and dates. 18" square pillow cover: $65.00 up to eight names and dates. 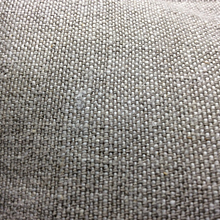 Pillows covers are made using 100% cream or sand-colored Belgian-flax linen. Inserts are not included. I will try to closely match thread colors of your preference. 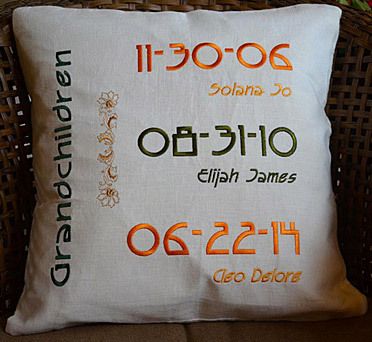 I use an Arts and Crafts-style font in the creation of this personalized family pillow.